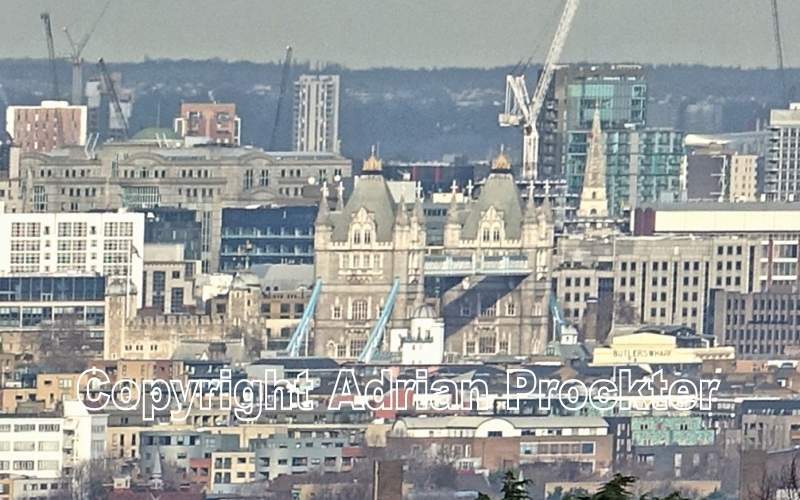 Above: Tower Bridge and the Tower of London seen from Westow Hill. Inner London has been likened to a saucer because there are hills to be found but, compared to the size of the land, they only rise by a small amount. In fact, the analogy is a good one if you consider a cross-section of Inner London from north to south. Both the cross section of the land and of a saucer are very similar. Of course, working east to west through the centre of London, the land is flat and almost level. There are a few small hills in Inner London – like Denmark Hill and Herne Hill. However, the highest land is to be found along a ridge to the north of Central London – with place names like Stamford Hill, Highgate and Hampstead. In the south, there is another ridge topped by a long winding road called Sydenham Hill, Crystal Palace Parade and Westow Hill. The last named road has one of the finest vantage points in Inner London. The turnings off one side of this road ‘drop like a stone’ due to the steep gradient. On a clear sunny day, when the air across London is not filled with smog, the views are superb, making it possible to see places of interest like the Tower of London and Tower Bridge. The approximate distance from Westow Hill to Tower Bridge is about six miles. If you know the riverside around Tower Bridge, it may be worth pointing out that the white walls below a grey cupula (in front of Tower Bridge) are the top part of the building that was once Courage Brewery. The building is now luxury apartments. At the same level as the old brewery but further to the right are the tops of more white walls. You may just be able to read the two words Butler’s Wharf. The wharf, one of the largest in Inner London has also been converted into luxury apartments with the well-known Pont de la Tour Restaurant at pavement level. If you are wondering about the horizon in the background, it is part of a ridge on which Alexandra Palace stands. This entry was posted in 1--Common. Bookmark the permalink.